Adventist Mission | Do You Know God? The Cross-Country Cycling Classic is one of the most important sports events in Belize. This one-day sports event is for amateur cyclists and has gained worldwide popularity. A government official, Monrad Metzgen, came up with the idea when he saw people from a small village on the Northern Highway covering long distances, on terrible roads, on their bicycles, to attend the weekly game of cricket. To Sabbath School teachers: This story is for Sabbath, March 10. Click here for photos to share while telling the mission story. But he stopped going to church while he was in high school. He was busy with his studies and with his friends. He didn’t think that he had time for God. After graduating, Angel landed a job with an airline called Maya Island Air. Every day, he went to the airport to load cargo on airplanes and to help customers at the front desk. He also got married, and soon he and his wife, Jonell, were expecting a baby. Angel actually didn’t know God. He didn’t want to lie, but he was too embarrassed to tell the truth. So, he argued with his relative instead. He changed the topic from God and told her that it wasn’t important to keep the Sabbath. He said that the Sabbath was only mentioned in the Old Testament and never in the New Testament. Angel felt miserable that night. He was unhappy that he had argued with his relative. He found a Bible and began to read it. He wanted to know God. As Angel read, he was surprised to find that the Sabbath was mentioned in the New Testament. He read in Hebrews 3 and 4 that God wants His people to keep the Sabbath. He read three times the words, “Today, if you will hear His voice, do not harden your hearts” (Hebrews 3:7-8, 15; 4:7). Angel decided that he had to obey God. He knew that he wouldn’t be able to work at the airline and keep the Sabbath at the same time. So, he prayed three times that night for God to give him the courage to quit work in the morning. His wife, Jonell, supported his decision, even though they were expecting the baby and the only money that they had came from his job. In the morning, Angel announced to his supervisor that he was going to quit. The supervisor urged him to stay and forget about keeping the Sabbath. But Angel’s mind was made up. He was going to keep God’s law. Angel had to work three days before he could quit. On his last day, he suddenly became very worried. He realized that he couldn’t return to work once he walked out the door. He wouldn’t receive a salary to feed his family. He didn’t know what would happen next. As he sat in a chair at the airport, the back of his neck got really tight with stress. Angel bowed his head and prayed for God’s help. As soon as he finished praying, he felt his neck muscles relax and the stress disappear. God started answering Angel’s prayer immediately. The airline gave him a bonus—quite a lot of money—to say “thank you” for his two years of work. Angel was surprised. “I didn’t deserve it because I quit, so I know it was from God,” he said. The money helped Angel take care of his wife and new baby for several months. Eventually, the money ran out, and Angel and Jonell had no money for two months as they looked for work. But they never ran out of food. Somehow, they always had food in their house—and Angel believes this was a miracle from God. Finally, Jonell got a job, working as a teacher at a high school. A month later, Angel became a teacher at another high school. 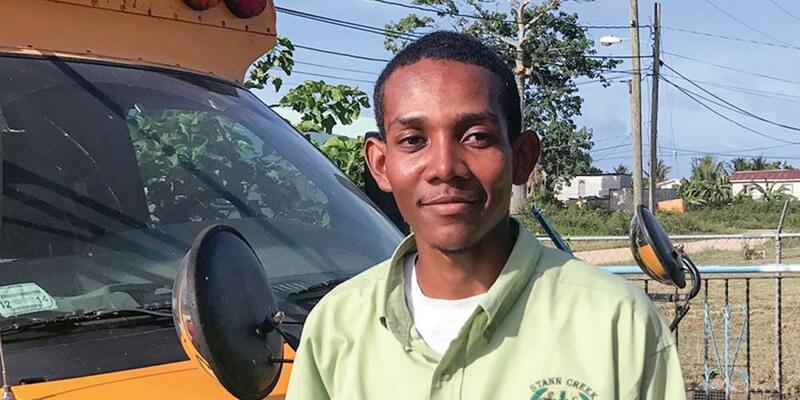 Angel’s school even provided him with training so he could receive a teaching license.